Hermon's Isaac Varney (right) puts up a jumper over Mount Desert Island's Andrew Shea during the Class B North championship in Bangor on Feb. 24, 2018. 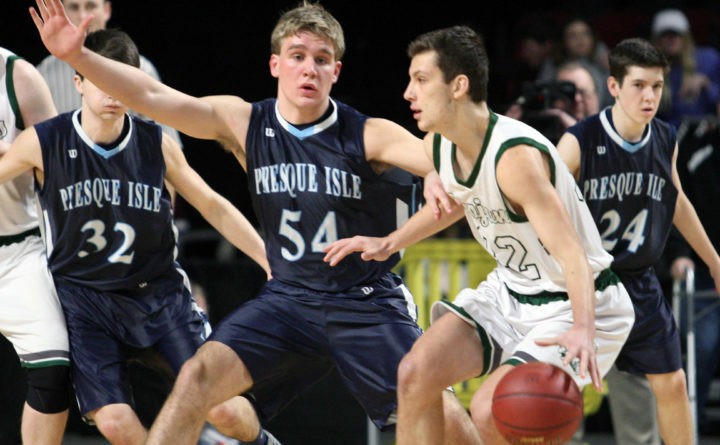 Presque Isle's Trace Cyr guards MDI's Derek Collin during the Class B boys semifinal in this Feb. 21, 2018, file photo. High school basketball players of generations past probably couldn’t relate to some of the individual matchups within games today. Back when offseason play was largely limited to a week at summer basketball camp and a month of summer-league games with your high school team, there was little opportunity to build relationships with players from rival teams. The emergence of AAU and other offseason travel basketball programs in Maine during the 1990s changed all that, as high school opponents are now routinely offseason teammates — and the best of friends. But that hasn’t necessarily changed the level of intensity between friends when they pursue opposing results on the court each winter. 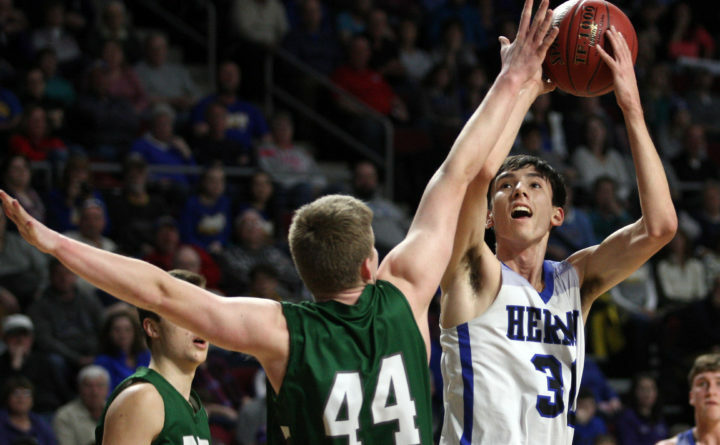 One of the subplots during Hermon’s recent 38-29 victory over Mount Desert Island of Bar Harbor in the clash of the last two Class B boys basketball state champions was the head-to-head matchup between two of those teams’ top players, Isaac Varney of Hermon and Derek Collin of MDI. The two have been AAU teammates with Black Bear North since their middle-school days. “I met Isaac in eighth grade, his seventh-grade year,” said Collin, a 6-foot-2 senior forward for MDI. “We were doing AAU tryouts, and right from that first tryout we became best buds, and we’ve liked each other ever since. They’ve also developed somewhat similar playing styles, with Collin averaging more than 20 points per game and also leading the Big East Conference in rebounding for MDI while Varney, a 6-4 junior, also ranks among the league leaders in both categories for Hermon, the 2018 state champion. They have considerable respect for each other’s game. Their familiarity with each other’s game was evident from the opening moments of their most recent clash. That was particularly noticeable on the defensive end, where their relentless work guarding each other was among the key reasons the game became a defensive battle. Varney finished with five points and nine rebounds, while Collin managed eight points and three boards. “Both Derek and Isaac, I thought, played as well as they were going to with how physical the game was,” MDI coach Justin Norwood said. “I knew it was going to be a dogfight [that night] both ways,” Varney said. They had better get used to it. After meeting three times last season — Hermon topped MDI 51-38 in the 2018 Class B North championship game after two regular-season clashes — they will square off at least once more this winter. And with 13-0 Hermon ranked first and 8-3 MDI third in the latest Heal Points, don’t be surprised if there is again a third meeting between the teams come late February. Collin and Varney expect to take the same approach to their future duels — beginning with a Jan. 30 rematch in Bar Harbor — as they did to their most recent outing.